Stay on our private island, voted 'Number One in the World' by Condé Nast Traveller. Includes accommodation, daily meals, return scheduled speedboat transfers, Jungle Walk with our Resident Naturalist and in-room wifi. Stay in our sanctuary nestled in the hillside of an ancient rainforest with a stunning outline of Mount Kinabalu on the horizon. Includes accommodation, daily meals, return scheduled speedboat transfers, Guided Nature Walk with our Resident Naturalist and in-room wifi. 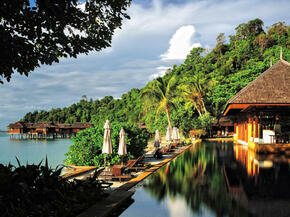 Stay in our sanctuary of traditional luxury and well-being steeped in age-old Malay traditions. Includes accommodation, daily meals, Jara Hill Walk with our Resident Naturalist, Kampong Sucimurni Lifestyle and in-room wifi.